St. Augustine once declared, “The world is a book, and those who do not travel read only a page”. From world explorations to spiritual pilgrimages to vision quests, travel has become one of the most sought after experiences in our culture, enhancing the breadth of our understanding and widening the scope of our world view. The idea of travel evokes images of exotic destinations, from the pyramids of Egypt to the Imperial Palaces of St. Petersburg to the rain forests of Brazil. Travel also has the potential to awaken the knowledge of a deeper connection to the Divine as a source of boundless freedom. We come to know ourselves through our journeys, which stretch and deepen the fiber of our humanity, humbling us and allowing us to recognize the threads connecting each being in the tapestry that is our world. The minute we choose to travel somewhere new or take a trip, the inner journey begins. Travel often has a way of initiating a process of discovery that leads to the lessons we are meant to learn in our present incarnation on this earth, even though we might have no conscious awareness of it beforehand. Travel can often bring the vision we want for our lives percolating to the surface of our consciousness. Throughout history humans have journeyed on spiritual pilgrimages and vision quests to give the prayer of love and to receive illuminations. We have traveled to foreign and distant lands acknowledging the outer journey as a quintessential metaphor for the sublime inner adventure. Today, travel is what we do when we have time off from work. But all too often, these travels are a means of escape, the intention behind them being to get away from something rather than to go to something. Traveling for the sake of escape traps our focus on what it is we are trying to get away from. Under these circumstances we focus on the relief of getting away from somewhere we didn’t want to be and more than likely, on the dread we feel about returning to it. This leaves little room for drinking in the moment, learning and exploring. But when we travel with the intention growing, discovering and opening ourselves to the vast expanse of potential, our focus shifts to the present moment allowing us to experience our lives fully and make the most of our travel experiences. Whether we choose a spa sanctuary, a yoga retreat or an extreme adventure, we have the opportunity to learn and grow from our unique experiences. Removing ourselves from the familiarity of our routine environment allows new and unexpected aspects of our beings to emerge. If we visit a country where another language is spoken, are we willing to risk speaking foreign sounds, or not understanding what comes back? Not only can we learn a new language, new customs and traditions, we can also extend the capacity of our hearts by connecting with others and ourselves in a new way. The gifts flow endlessly when we are willing to risk being outside of our comfort zones. An organic process unfolds when we travel consciously. On our typical biannual vacations, we often attempt to leave the modern world behind. Cell phones, the internet, computers, pagers, television and the myriad other hybrid communication devices are sometimes abandoned for rest and rejuvenation. While we certainly need these deserved reprieves, there are great rewards to be reaped by setting an intention for our travels and actively exploring the possibilities for growth and discovery that are present in every journey. Staying present during travel also brings us new levels of awareness of how to learn and grow in this life. The Journey - A Memoir. My trip to the Southwest began months ago. The constant sense of discomfort I was feeling in my urban life was becoming more and more oppressive. I was chronically planning escapes to places I imagined would be better for me, would bring me more peace, less struggle, cleaner air. I told myself and others often how I would just like to get away. In fact, throughout my life, I can remember feeling as though I have always had one foot out the door in one way or another. As I pondered this in meditation, it dawned on me that perhaps I was out of balance. I wondered about my dis-ease with my surroundings. After all, I was born and raised here, although I have traveled widely and lived in other countries for months at a time. Approaching my awareness with equanimity, I acknowledged my deeper intention: to reconnect with the earth here in the United States. In spite of all the political, personal and social issues I struggle with, I recognized that it was my own upset and perception of darkness that was disconnecting me. I heard the calling to make peace from within. A good traveler has no fixed plans and is not intent on arriving. The ancient wisdom of Lao Tzu rushes up from the heat waves that hover over the Arizona desert. As I drive in silence deeper toward the horizon, the houses, the cacti and other small trees and brush disappear. There is less and less to hold onto. It lies in the heart of the Navajo reservation in the city of Chinle, Arizona. 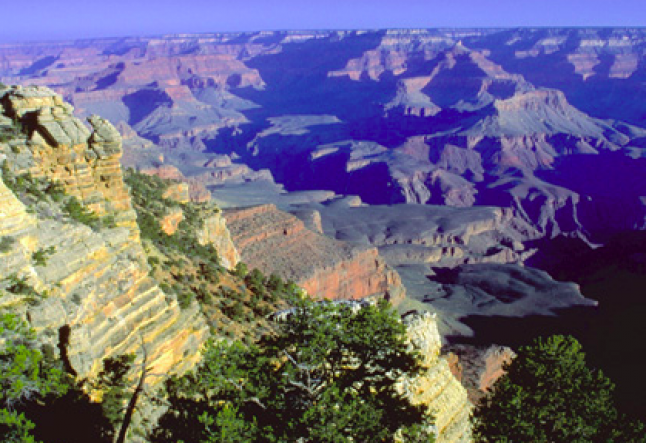 For centuries the Navajo, as well as the Anasazi, an indigenous tribe that preceded them, lived there and considered the Canyon their birthplace. Canyon de Chelly has been continuously inhabited since 300 AD, a remarkable feat, considering the drastic changes that have occurred throughout its history. The ‘de Chelly’ is actually a Spanish mispronunciation of the Navajo word “tseyi” (pronounced ‘tseyee’), which means “within the rock”. My friend and I make the 6-hour drive from Phoenix. I am allergic to something in the Arizona air. My head begins to fill up like a bubble with too much pressure that I don’t know how to release. It takes me a few hours...days, to find the amusement in this, but eventually I come around. As we arrive in Chinle, the sun is making its descent. We continue through the non-descript town towards our hotel, the Thunderbird Lodge, the only hotel located inside the park. We check in and find our room is clean and spacious. Both of us are famished after the long drive, so we venture to the Thunderbird Lodge Cafeteria for dinner, which was built in the old Sam Day trading post established in 1896. It’s filled with dream catchers, Navajo rugs and weavings and other crafts. The staff is entirely of Navajo descent. We eat slowly, taking in our new surroundings and enjoying the simple but nourishing food. Well fed and sleepy, we retire early. The morning air is crisp and the sky is a piercing blue. After a light breakfast we are ready to discover the treasures of this remote area. Canyon de Chelly is actually two canyons; the northern section is Canyon del Muerto, or Canyon of the Dead, named for the large prehistoric Native American burials discovered here. Because the canyons are part of the Navajo reservation, which covers 27,000 square miles of land, only an official Navajo guide can take visitors inside. Group trips can be arranged through the Thunderbird Lodge, but I am more interested in having a private guide so we can move at our own pace. A small wave of anxiety comes over me as I begin to worry about finding the right person to be our guide, but I take a deep breath and surrender, flowing with the spontaneity of the moment. We make our way to the Canyon de Chelly Visitor’s Center just outside the lodge’s entrance and the park’s ranger organizes a private guide for us. Kendall is full-blood Navajo with a soft demeanor. His grandfather and father also led tours in the Canyon. He is extremely knowledgeable about the history of the land and his ancestors who lived here. We drive down into Canyon del Muerto and come upon several ancient rock paintings and carvings that were left behind hundreds and thousands of years ago by the Anasazi and the Navajo. As we continue, Kendall shares with us the beliefs of the Navajo and the significance of the Four Worlds and Four Directions in their tradition. I listen intently to Kendall, feeling his words and noticing where they resonate inside of me. The red rock walls extend toward the blue expanse of sky, stalwartly continuing their ancient vigil over the canyon. I am yearning for a harness and shoes, but climbing is prohibited inside the canyon. We soon discover the dwellings of the Anasazi and the Navajo located low on the sandstone walls. The ancient houses give Canyon del Muerto a mesmerizing feeling. Thankfully, there are few other visitors and we are left with the sound of the breeze rustling the cottonwood and tamarisk trees and a lone bird’s song. We make a final stop to peruse the jewelry and craft tables of the local people inside the canyon and begin to sense what modern life is like for the Navajo. Kendall tells us that 80% of his people living on the reservation speak their native language and their cultural ways are strongly preserved. The vendors appear solemn as they wait for us to purchase something. I can see from what Kendall has told us and from my own observations and education that the Navajo are and have been a people who live in harmony with the earth. I feel my own enthusiasm to fulfill my intention. I want to learn more from them, feel the strength of this ancient tribe. We drop Kendall back at the Visitor’s Center, but before we say goodbye, he directs us to drive to Spider Rock at the end of the south rim of the canyon. We thank him, and browse the exceptional bookstore inside the visitor’s center. It is already late afternoon when we drive across the south rim of Canyon de Chelly. We visit many stops along the way and are deeply impressed by the views from each lookout. As I take in these spectacular vistas, I wonder about our journey here, and my own intention. Have I begun to fulfill it? I attempt to take a deep breath, but my nose and head are useless. Where is Ganesh when you need him most? We follow the road down toward Spider Rock as the sun is setting and park the car. On foot, we make our way to the lookout. In my experience, the Sublime does not come on suddenly. It is a gradual opening into perception. The Divine has gracious pacing and honors the rhythm and shades of human experience. As I enter the realm of Spider Rock, it is like entering an ancient meditation room. The expanse of the canyon and huge red monoliths are surreal, yet I am pulled into my body. Silence and stillness fill the emptiness and flood all the spaces of my being. I have sat many hours in meditation, day after day without words, to arrive at this place inside. And while words can be used to describe such extraordinary fulfillment, the alchemical mystery cannot be expressed in mere words. In the awe and wonderment, a wave of recognition comes. This is a chamber in the heart of the earth. Darkness is upon us, and I feel myself plotting my return to this place in the morning, the next day, the next month and so on. I amuse myself at how quickly I can covet. We return to the lodge in silence, deeply changed on levels that perhaps are still unknown to us. Every journey has its own texture, not only from the people who accompany us or the changing land and weather, but because the inner landscape of one’s own life is constantly shifting like the sands of the ocean floor. 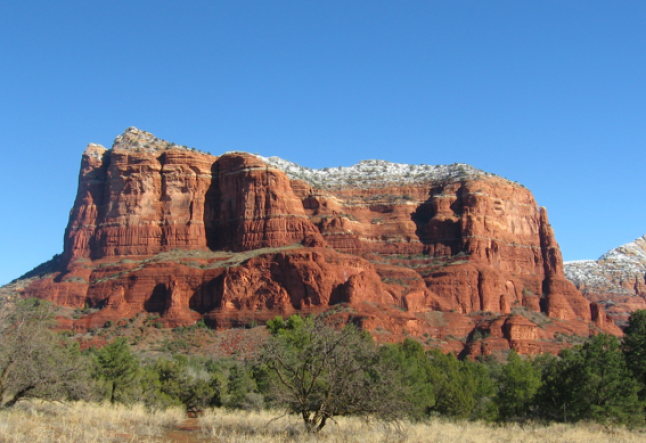 The next morning, we leave Chinle and head toward Sedona. On the way, I am popping with realizations about my life and my own journey. As we drive, I remember a long adventure I took across Australia into the most remote places of the Aboriginal lands. The three-month visit was the most arduous and emotionally challenging trip I can recall, driving for hours on end without seeing a soul and nothing in the landscape to hold onto. And yet when I remember that trip, I feel only the love and depth that I experienced, nothing else. Unbeknownst to me at the time, it was a pilgrimage and vision quest of sorts. 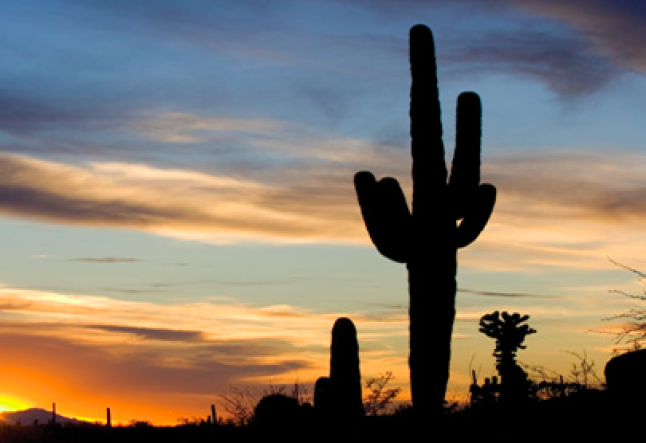 As we continue through the Arizona wilderness, a deeper awareness surfaces. Sensory indulgence beyond my inner limit seems a distraction from the true nature of my being. While the luxury of the five-star accommodations I have had the privilege of visiting are both beautiful and supportive to my physical body and aesthetic sensibility, it is this hunger deep in my heart that I am truly asking to be fulfilled. When I attune myself to this inner calling, I am filled with a sense of integrity and presence on my journey. In a new way, I find myself profoundly understanding spiritual practices such as fasting and silence that give space for the relationship with the Divine to prosper. I have made arrangements with a close friend to meet up with a friend of his in Flagstaff. We agree to go hiking just a few miles outside of Sedona. 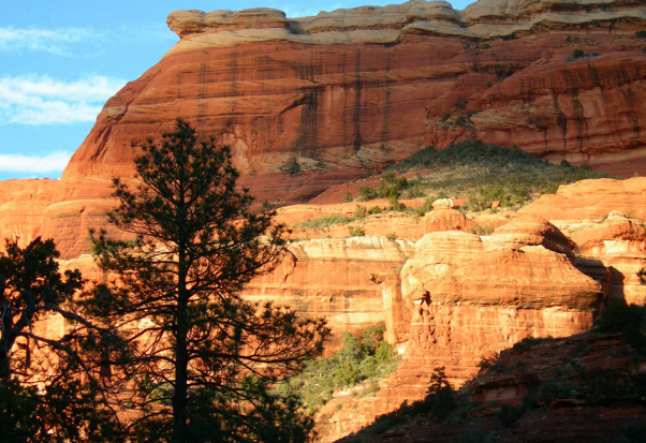 We head to the West Fork trail of Oak Creek Canyon. Breathing in the smell of the earth, and dipping my head into crystal creek waters feels decadent. We hike for hours in the brilliant fall foliage and connect with each other, enjoying the beautiful country and being filled to the brim. At the end, we sate our hunger with apples from the trees. We say goodbye to our new friends, and continue on. 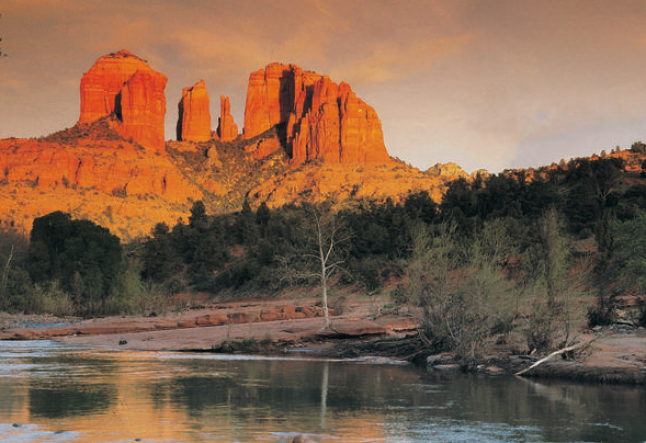 As we venture down the winding road toward Sedona, I feel the breeze and smell the creek and the cold damp stones. The red and orange leaves in the trees are rustling gently, and it seems this journey is awakening me to the possibilities. An old story comes to mind of a rabbi and his son. The rabbi’s son goes out every day to play in the fields and the orchard.